With one road victory already in hand, the University of Hawai’i basketball team is aiming for another on Saturday. Following an 80-71 win at UC Riverside on Thursday night, the Warriors made a one-hour drive to Fullerton, Calif., on Friday to prepare for Saturday’s game at Cal State Fullerton. Hawai’i, which is on a six-game winning streak, is 14-2 overall and 3-0 in the Big West Conference; Fullerton is 8-7 and 1-1. Saturday’s game is scheduled to start at 4:00 p.m. (Hawai’i time) at Titan Gym. It will not be televised, but a live video broadcast will be streamed online at www.espn3.com. The Warriors led practically from start to finish in its win at UC Riverside. In the absence of leading scorer Aaron Valdes, Hawai’i got a boost from senior guard Quincy Smith – who had career-highs of 17 points and 37 minutes – and several others. Valdes was not in uniform at Riverside and his right foot was still in a walking boot due to a turf toe injury. His status remains in question for Saturday’s game. Even without him, the Warriors were able to hit their average of 80 points, with Smith, Stefan Jankovic (15 points), Mike Thomas (15 points, 9 rebounds) and Isaac Fleming (15 points, 4 rebounds) combining for 62 of those points. Jankovic is now tied with Valdes for the team scoring lead at 14.8 points per game, and “Janks” also leads the team in rebounding (6.5 per game) and field goal percentage (.564). Senior point guard Roderick Bobbitt created some pregame anxiety with his game-day arrival for the UC Riverside contest, but he still managed to contribute six points and five assists in 32 minutes off the bench. He will likely be re-inserted to the starting lineup on Saturday. Bobbitt is averaging 13.4 points, 5.3 assists and 4.5 rebounds per game, and also leads the team with a .838 free throw percentage. Fleming is averaging 11.0 points, 2.9 rebounds and 2.4 assists per game; Thomas is contributing 7.6 points and 4.9 rebounds per game and has a .561 field goal percentage; Smith is averaging 6.8 points, 3.8 rebounds and 2.7 assists per game. The Warriors will also have to be at their defensive best against a Fullerton team that features junior guard Tre’ Coggins, who has emerged as one of the most dynamic individual players in the conference. Coggins, a 6-foot-2 transfer from Air Force, is averaging 18.5 points per game, and is coming off a 41-point performance in a loss to CSUN last week. He has scored 20 points or more in six games this season, and has made at least two 3-pointers in each of the 15 games he has played in. He currently ranks second in the Big West with 50 3-pointers. There are other scoring threats on the Fullerton roster. Malcolm Brooks, a 6-5 senior guard, and Khalil Ahmad, a 6-4 freshman guard, are both averaging 13.1 points per game. Fullerton’s main post players are big bodies that are primarily used for defensive and rebounding purposes. 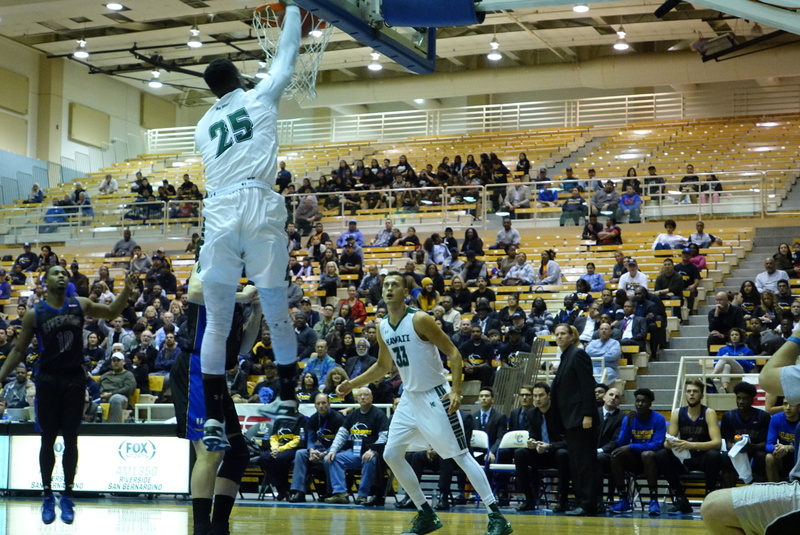 Jamar Akoh, a 6-7, 240-pound sophomore, is averaging 3.9 points and 6.1 rebounds per game; Kennedy Esume, a 6-10, 245-pound senior, is averaging 3.0 points and 5.8 rebounds per game. * UC Irvine at UC Santa Barbara: The Anteaters (14-5, 3-0) are tied with Hawai’i atop the conference standings, and just earned a crucial 58-54 road win at Long Beach State on Thursday. 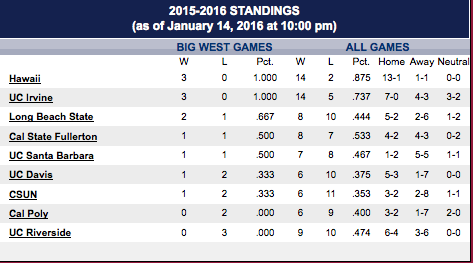 If UCI can get another road win at UCSB, it has to be considered the front-runner at this early stage of the season. UCSB (7-8, 1-1) can justify its position as a title contender with a home win over the Anteaters. * Long Beach State at Cal Poly: After a disappointing home loss to Irvine, the 49ers (8-10, 2-1) will try to make up for it on the road at Cal Poly. The Mustangs (6-9, 0-2) have already lost to Hawai’i and UCSB and need to knock off a contender if they want to be considered a contender themselves. Best 3 guard tandem in decades for UH..
another tandem? ncaa bound..trevor ruffin, kalia Mcgee, and Jarin Akana..
Or Predrag Savovic, Carl English and Mike Mcintyre..not quick, strong , good shooters and BBIQ smart..3 guard tandem ncaa 2 consecutive ncaa invites! Maark Campell good point guard, fast and hops! Mark Campbell 6’4″ 185 GREAT PG, along with SG Michael Keubler, Jason Carter PG.. another tandem..UH had some good guards.. not 3 with quickness of Q, Zero, and KingB, however they went to NIT’s and NCAA tournaments. 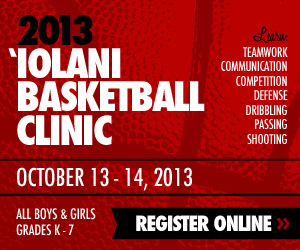 Looking to Win, Better DOMINATE, BACKCOURT Play As Usual…. ?HOT! Dominant Fleming ? NO Answer ? With Continued(?) Hot-Shooting Janks, MT, Sai? WeBleedGreen … prior post, i see you and your son now with my magnifying glass and looks like you bring good luck to the team. Who’s the kid that just tweeted he committed to UH for basketball? We use 4 expert points defenders on their 3 dangerous shooters all game long!? I have Apple TV, can watch ESPN3 on TV! But today, have to watch on phone app while also watching Packers on TV. Damn. Cannot believe games on at same time. Go Pack Go! Go Bows! Go Wahine! Did you guys see the stat line on that Irvine/Long Beach game? Both teams shot under 30%…pretty ugly or really good D? Lot of turnovers. Fullerton, 2 guys left the team,one top scorer from last year. Leaving only perimeter Fullerton players to carry offense, 3 bombs and transition. UH should win,.. they are 7.5 point favorites.. UH should be leading at the half by 25 points minimum..
Bobbitt return to starting five..
Zach, Dyrbe and 50 crew, be ready to play some 15 minutes or so.. blow out city. Auburn beat Kentucky 75-70, per McInnis. As to new recruit – cant find out anything about him Will be interesting to see the type of players new coaches recruit as they have yet to prove themselves here. Thought they would use Jakob given then brought him from Australia but seems he is a long what down the line! 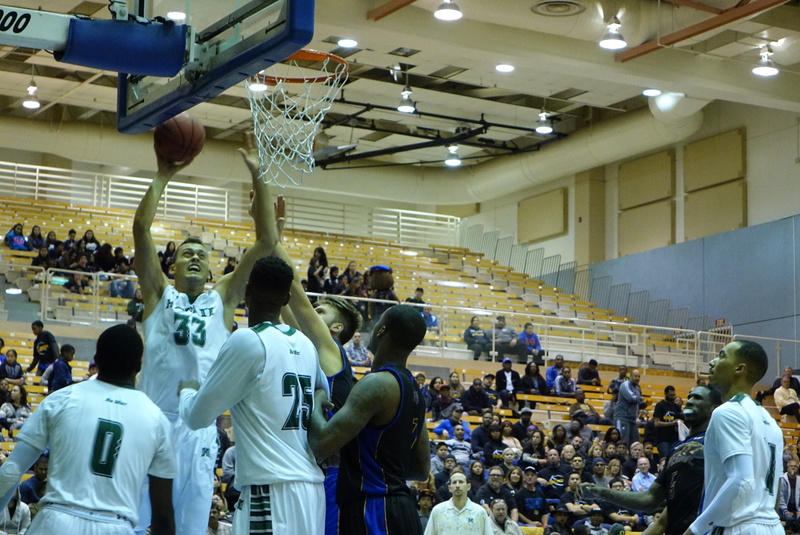 Irvine moves to 4-0 after 61-52 victory over Santa Barbara. Irvine shot 19 of 32 FTs; UCSB 1 of 5. OK, bring on the real game! Ugh. Hawaii shooting 11 of 33 from the field, including 2 of 13 from 3-point range. Fortunate to be up by two at the half.